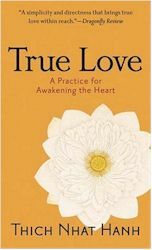 In this little treasure, Thich Nhat Hanh offers a Buddhist view of love along with techniques for manifesting it in our daily lives. In his characteristically direct, simple, and compassionate style, he explores the four key aspects of love as described in the Buddhist tradition: lovingkindness, compassion, joy, and freedom. In order to love in a real way, Thich Nhat Hanh explains, we need to learn how to be fully present in our lives. In True Love he offers readers the technique of conscious breathing as a method for synchronizing the mind and body to establish the conditions of love. He goes on to offer a mantra practice for generating love that consists of expressing four key statements or intentions in our relationships. These include: "Dear one, I am really there for you"; "Dear one, I know that you are there, and I am really happy about it"; "Dear one, I know that you are suffering, and that is why I am here for you"; and "Dear one, I am suffering, please help me." In the concluding section of the book, Thich Nhat Hanh explains how love can help us to heal our own pain, fear, and negativity. He explains that we must not regard negative emotions as bad and repress them. We must recognize them as part of us and allow them into our consciousness, where they can be cared for by the "loving mother of mindfulness." "(Thich Nhat Hanh) shows us the connection between personal, inner peace and peace on earth." "Among Buddhist leaders influential in the West, Thich Nhat Hanh ranks second only to the Dalai Lama."